This is a traditional French dessert. You will find them in every bakery in France. They can be filled with confectioner’s custard or Chantilly cream. I have decided to fill them with confectioner’s custard. I will use the same recipe as for my raspberry pie. How to make the pâte à choux or choux pastry? Pour milk and water in a pan. Add the salt, the sugar and the butter. Keep stiring until boiling. Add the flour and stir energetically until the pastry is smooth and homogeneous. Put the pastry in a bowl and add the egg and keep stiring. Once done, put the mixture in a pastry bag and create the choux on a baking sheet. Bake them for 20 minutes and let the choux cool down. How to make the confectioner’s custard? In a bowl, mix the egg yolks with the sugar. Then, add the flour and maizena. In the same time, boil the milk with the vanilla sugar in a saucepan. Once boiled, add the milk to the mixture but keep stiring with a wooden spoon. Put back this mixture in the saucepan to heat still stiring. The mixture is thickening and we get the cream. Put the cream in a bowl and add the little piece of butter on the top. This is to avoid to get a skin on the cream when cooling down. Once the choux are cold, cut them in two part. Fill them with some confectionner’s custard. Put some icing sugar on the top of the choux and savour the result. 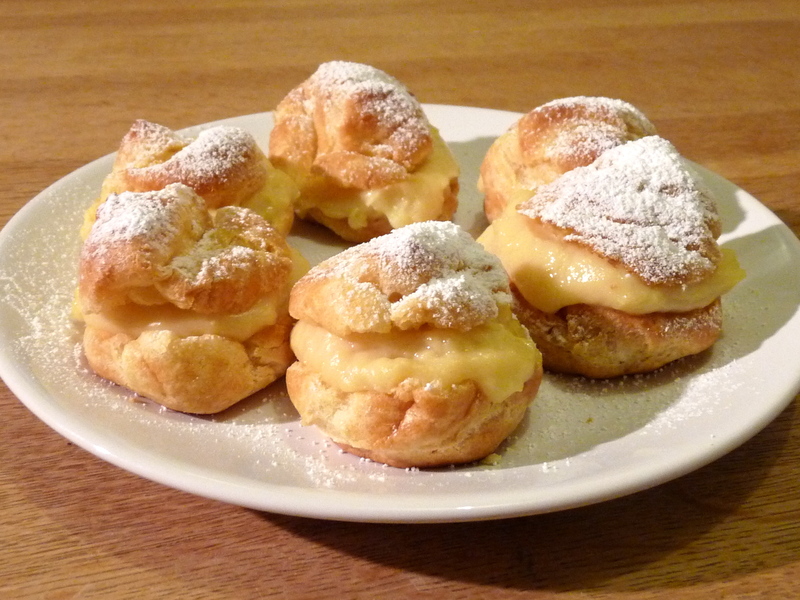 This entry was posted in Recipes and tagged choux, Choux à la crème, choux pastry by thebloodyfrog. Bookmark the permalink. Hahaha! In France, we don’t really eat them for breakfast but it could be a nice way to begin the day!